Hylomar Limited manufactures the world’s leading range of high performance, non-setting gasket and jointing compounds. The original product was developed in conjunction with Rolls-Royce and was used for sealing aircraft engines. Hylomar continues to manufacture Rolls-Royce approved products for sealing aeronautical turbines. Widely used in the automotive, aerospace and industrial aftermarkets. Engine, compressor, electric motor, heavy industrial equipment, gearbox, defence industry component, turbine and many other original equipment manufacturers also choose Hylomar non-setting compounds for their sealing and bonding applications. A solvent free, non-setting gasket and jointing compound based on the non-setting Hylomar Universal Blue polymer system. Hylomar Advanced Formulation (AF) has an unlimited assembly time making it ideal for use on components that take a long time to assemble. The product does have some differences to Universal Blue in that the gap filling capability is slightly reduced but it can be applied via robotic application. Widely used in the automotive industry, particularly on gear box and transmission housings and flanges, where it is resistant to gear oils that attack silicones. Applies smoothly and easily without the maintenance issues and curing problems associated with silicones and anaerobics. Particularly suitable for use as a solvent free gasket dressing to aid positioning of gaskets prior to assembly. Available in standard and high viscosity grades. 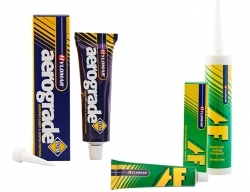 Hylomar Aerograde Ultra is a highly engineered, polyester-urethane based non-setting and non-hardening gasketing compound, for use in the aeronautical industry. It was developed in response to requests from Rolls-Royce Aerospace Division for a Hylomar AeroGrade formulation which was free of chlorinated solvents. Aerograde Ultra carries the Rolls-Royce MSRR 9055 approval. Aerograde Ultra utilizes acetone instead of chlorinated solvents, which results in the product being considered "flammable" until the product is applied and the acetone has evaporated. Non-setting gasket and jointing compound baseds on the Hylomar Universal Blue polymer system. Distributed by NLS Products.